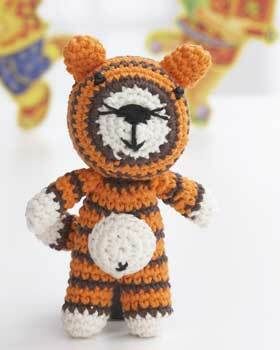 Celebrate the Year of the Tiger with this free crochet pattern from Lily Sugar n' Cream for all skill levels. He's just too cute not to keep out or give as a gift to those animal lovers. Crochet Hook: size 3.5 mm (U.S. E or 4) or size needed to obtain gauge. Small amount of black embroidery floss for nose, mouth and belly button. With B, work 1 rnd. With C, work 2 rnds. These 3 rnds form Stripe Pat. 3rd rnd: Ch 1. *2 sc in next sc. 1 sc in next sc. Rep from * around. Join with sl st to first sc. 18 sc. 4th rnd: Ch 1. 1 sc in each sc around. Join B with sl st to first sc. 5th rnd: With B, ch 1. 2 sc in each sc around. Join C with sl st to first sc. 36 sc. 6th rnd: With C, ch 1. 1 sc in each sc around. Join with sl st to first sc. First 2 rnds of Stripe Pat are complete. Keeping cont of Stripe Pat, rep last rnd 7 times more. Next rnd: Ch 1. *Draw up a loop in each of next 2 sc. Yoh and draw through all loops on hook – sc2tog made. 1 sc in each of next 4 sc. Rep from * around. Join with sl st to first sc. 30 sts. Next rnd: Ch 1. *Sc2tog over next 2 sc. 1 sc in next sc. Rep from * around. Join with sl st to first sc. 20 sts. Next rnd: Ch 1. *Sc2tog over next 2 sts. Rep from * around. Join with sl st to first st. Fasten off. 10 sts. Stuff rem of Head. Draw yarn through rem sts. Pull tightly and fasten securely. 3rd rnd: Ch 1. 1 sc in each sc around. Join B with sl st to first sc. 4th rnd: With B, as 3rd rnd. First rnd of Stripe Pat is complete. Keeping cont of Stripe Pat, rep last rnd 3 times more. Fasten off at end of last rnd. Next rnd: Ch 1. 1 sc in each of next 6 sc of Second Leg. Sl st in first sc of First Leg. 1 sc in same sp as sl st.1 sc in each of next 11 sc of First Leg. 1 sc in each of last 6 sc of Second Leg. Join with sl st to first sc. 24 sc. Keeping cont of Stripe Pat, rep last rnd 5 times more. Next rnd: Ch 1. *Sc2tog over next 2 sc. 1 sc in each of next 4 sc. Rep from * around. Join with sl st to first sc. 20 sts. Rep last rnd once more. Next rnd: Ch 1. *Sc2tog over next 2 sc. 1 sc in each of next 3 sc. Rep from * around. Join with sl st to first sc. 16 sts. Next rnd: Ch 1. *Sc2tog over next 2 sts. 1 sc in each of next 2 sts. Rep from * around. Join with sl st to first sc. 12 sts. Fasten off. 3rd rnd: Ch 1. 1 sc in each sc around. Join with sl st to first sc. Fasten off. With black embroidery floss, embroider belly button. Stuff Tummy lightly and sew to front of Body as shown in picture. **1st rnd: 6 sc in 2nd ch from hook. Join with sl st to first sc. 2nd rnd: Ch 1. *2 sc in next sc. 1 sc in next sc. Rep from * around. Join with sl st to first sc. 9 sc. Keeping cont of Stripe Pat, rep last rnd 5 times more. Fasten off. With C, ch 2. Work as given from ** to ** for Arms, omitting references to color changes. Fasten off at end of last rnd. Work as given for Arms. Stuff Tail lightly. Sew Head to Body. Attach Ears to top of Head. Attach Arms to sides of Body. Attach Tail to back of Body. Sew beads to front of Head for Eyes. With black embroidery floss, embroider nose and mouth. Confussed? The topic stated "DETRIOT LION" This is a tiger....If this represents Michigan, it should be stated as DETRIOT TIGERS....Detriot lions are a Football team, the tigers are a baseball team! Are there other "Year of the ..." available?? ?